The last few weeks of this term have been very productive and eventful including the Inaugural AFL Trip to Melbourne. On Tuesday morning 40 students and five staff left for Melbourne to embark on a week of immersion in the AFL culture and activities. The students and Mr Hendricks have the fantastic opportunity to be the guard of honour at the Western Bulldogs versus Geelong game at Etihad Stadium on Friday 29 June. Our Mater Dei students will be dressed in Western Bulldogs jerseys for the guard. The Senior Girls AFL team had a convincing win against Corpus Christi College on Tuesday afternoon. They are now scheduled to play in the final next term at Optus Stadium. Well done ladies! Congratulations to all students and staff involved in the recent MADD week. Thank you to Mr Basile, Mr Hurd and staff for an eventful week of entertainment and activities to promote the Arts in the College. I urge students to get involved in the many opportunities available. The recent visit to St Elizabeth’s Catholic Primary in Hocking was a lovely morning, thanks to our talented musicians and dancers. The kindy to year 3 students enjoyed the Mater Dei Band as they played many of their favourite songs and they were in awe of our dancers. Thank you to Principal Mrs O’Shaughnessy for her warm welcome. 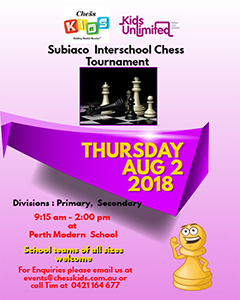 Our Chess Team has done very well in the recent competition. Mater Dei College, will now compete next term for the chance to represent WA at the 2018 Australian Schools Teams Championships. Another great achievement from Mater Dei students! A reminder to all families Term 3 commences for students on Wednesday 18 July. Another date to remember is the Parent/Student/ Teacher interview day on Tuesday 17 July. This is a designated Home Study Day for students to enable staff to conduct interviews into the evening. Students are reminded to attend interviews with parents. The parent interview timeslots are to be made online as in previous years. I encourage parents and guardians to meet with teachers in the best interests of your children. As the term draws to a close this week our College will farewell Mrs Hillary DeGraaf, Public Relations and Marketing Officer. Mrs DeGraaf is pregnant with her second child and is due in the next few weeks. 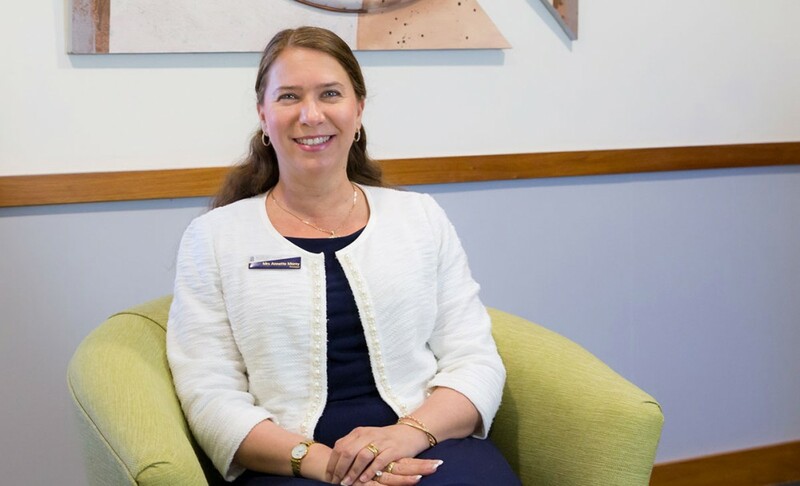 My sincere thanks to Mrs DeGraaf for her commitment to Mater Dei College and the new marketing and branding initiatives she has coordinated in her time at the College. We welcome back, Mrs Paula Trevor who has returned to the role of Public Relations and Marketing. 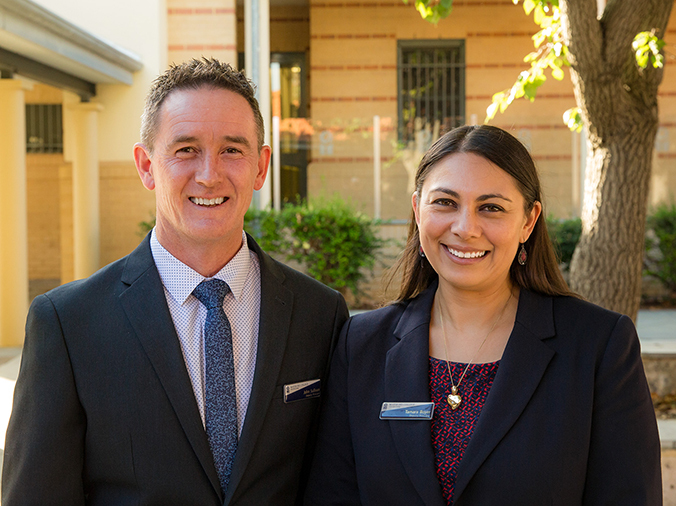 My thanks to families for your support as this week marks the end of my first year as Principal at Mater Dei. I sincerely wish all families an enjoyable holiday break and a safe return in Term 3. O’ Lord, we ask for a deep and genuine concern for other people which will remind us that the discovery of truth is not to be a victory for some and a defeat for others. Help us to understand that unless all can claim a share in that victory, truth itself will continue to be rejected by the losers, because it will be regarded as inseparable from the yoke of defeat. And so, confrontation, controversy and the like, might yield to a genuine united search for Your truth and how it can best be served. Amen. During the holiday break, please use this opportunity to check that winter uniforms are in order for the beginning of Term 3. For example, girls’ skirts should be knee length and, as students are growing, the hem may need to be taken down. Boys are also encouraged to have their hair cut appropriately. The College’s Uniform and Personal Presentation Policy can be found on SEQTA if you require further information. We look forward to seeing all students return to school on Wednesday July 18 well rested and well presented. The Bishops' Religious Literacy Assessment is a large-scale, standardised assessment that consists of a series of Religious Education (RE) tests developed and marked by the Catholic Education Western Australia (CEWA). The purpose of the BRLA is to measure student learning of the content in the RE curriculum by providing a ‘point in time’ snapshot of student performance in RE. Students’ knowledge and understanding of the RE curriculum is assessed using a combination of multiple choice, and short and extended response items. Students’ faith is not assessed. The use of the BRLA complements the school based assessment programs in RE. 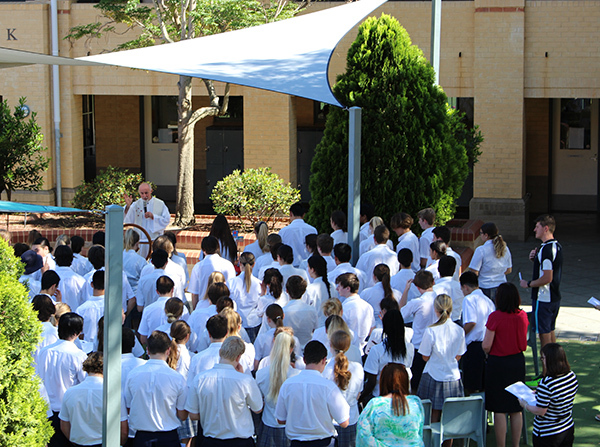 At the request of the Western Australian Bishops, Year 9 students in Catholic schools across Western Australia will take part in The Bishops' Religious Literacy Assessment (BRLA) from the week commencing Tuesday 24 July in Term 3. The assessment will be accessible to students only online. Formal school and student reports are produced by the Office and will become available to schools in Term 4. Please contact your child’s teacher or Head of Religious Education, Dr Keady, if you have any enquiries regarding the administration of The Bishops' Religious Literacy Assessment. The next round of OLNA begins in Week 7 of Term 3. Students in Years 10, 11 and 12 who are still required to pass one or more OLNA assessment areas are strongly encouraged to practice their literacy/numeracy skills using the online subscription which was purchased for them. This package enables students to practise questions from past OLNA tests at home or at school, and provides specific feedback to students including suggested strategies. Parents, please encourage your Year 10, 11 or 12 student to login to https://olna.com.au/ using their Mater Dei email address and password and practise regularly. After school OLNA support sessions will begin again in Week 1 of next term. Note – Compulsory attendance is required for all Year 12 OLNA students and is strongly recommended for students in Years 10 and 11. The office will be closed for Week 1 of the school holidays and Monday of the second week. We will reopen Tuesday – Friday (Week 2 of the holidays) 10 – 13 July 2018. 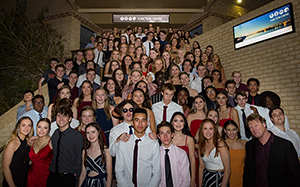 On Friday 15 June, Year 11 celebrated the completion of Semester One exams by attending the 2018 Dinner Dance at AQWA. As we arrived, we were greeted with a ‘mocktail’ and were surprised by Mr Green swimming with the sharks. We were lucky enough to experience AQWA after dark, having the opportunity to walk around getting photos with the beautiful sea animals and by the touch pool. Once we had finished taking hundreds of photos and selfies, it was time for dinner. We had a delicious buffet and I think there were a few loosened belts and tighter dresses. We then danced on the dance floor, burning off some energy to make room for dessert, which was a donut wall with a range of our favourite toppings. All the girls tried to dance the night despite the pain of our aching feet, we did a pretty good job but struggled to walk the next day. We can’t forget to mention how the whole year group stood on the stairs of AQWA to get a group photo and it was then that the teachers found out that we actually did know the school song, as we belted it out for the whole of Hillarys to enjoy. We would like to show our gratitude to Mr Green and all who contributed to the incredible night and thank AQWA for allowing us the space to enjoy ourselves. I think we can all agree, that the 2018 Dinner Dance was one to remember and we have one piece of advice for the future Year 12 girls – bring spare flat shoes! In week 8, students in the Visual Art department involved themselves in a range of activities celebrating MADD week. 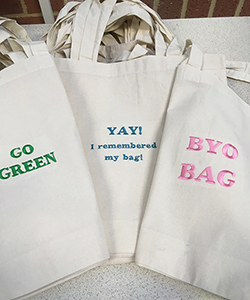 The department has embarked on a range of creative projects this semester, and DD week provided another opportunity to foster this creative spirit. Students worked on range of activities from, mural painting, Cupcakes, colourful Skulls to designing Skateboard decks. The walls of Salvado block are beginning to change, with large colourful imagery being installed. The process is building towards our annual Term 3 Showcase exhibition which will highlight the Arts and Technologies Learning areas. Student paintings and designs will adorn the walls showcasing creativity on a large scale. On Monday and Wednesday of Week 9 this term, our Year 8 Science classes had the opportunity to participate in an incursion, presented by Woodside. Our two presenters, Mr Luke Clowes and Mr Anthony Burke spoke to the students about their different roles in the Oil & Gas industry, and how studying STEM courses in high school and university can assist students in a huge range of different careers in the future. More importantly, our students also had the opportunity to use some virtual reality (VR) hardware and software to explore an oil and gas Rig located off the coast of WA. 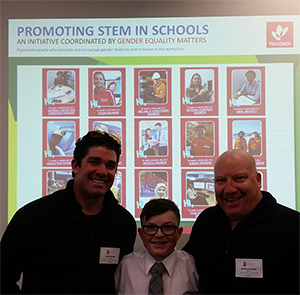 Students had great fun using the VR goggles and the incursion was made all the more special for Riley Burke, one of our Year 8 students, as his father and uncle were the presenters for the day. A big thank you goes to Woodside for offering this invaluable opportunity and for instilling a passion for STEM in our Year 8 students. 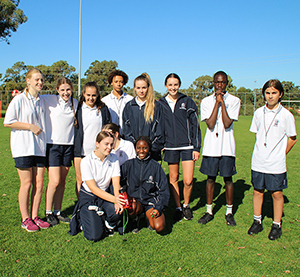 Year 9 Students Umpire Catholic Primary School Interschool Lightning Carnival. Any Year 11 or Year 12 student who would like some additional help with their upper school ATAR Science subjects, please feel free to come along to the after school, Wednesday sessions indicated below. The teachers listed will make themselves available on their scheduled date from 3:30 – 4:30pm in Siena 6 (next to the Science office). These sessions are designed for you to ask questions or review concepts. Please note, they are not designed for the teacher to prepare additional notes or resources for you. 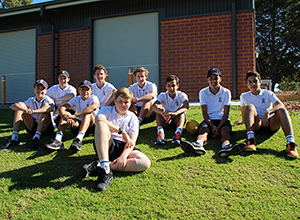 On Friday 15 June, the Year 11 Physical Education Studies ATAR students participated in an excursion to Edith Cowan University (ECU). The class learnt about VO2 Max (the measurement of the maximum amount of oxygen that an individual can utilise during intense, or maximal exercise). The test was conducted using an exercise bike and we measured the person’s heart rate and blood lactate during the test. The session at ECU was a positive learning experience especially working in the amazing Sport Science Laboratory throughout the day. 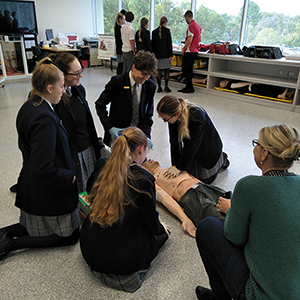 On Wednesday 13 June, the year 11 Human Biology ATAR classes, were lucky enough to attend an excursion to Edith Cowan University. We got to experience campus life and get an insight into some science courses offered. We learnt many new skills and had the chance to talk to some of the lecturers. For the first session, students had the choice of either Occupational Therapy, or Exercise and Sport Science. We experienced the equipment used by university students and learnt about the career options for these courses. It was a lot of fun. Our second session included either, Speech Pathology or Health Sciences. Here we learnt about the International Phonetic Alphabet, the benefits of eating a nutritious diet and many other interesting things. Finally, we had the choice of Medical Sciences or Paramedical Sciences. We learnt how to use a heart rate monitor, give injections, drill a hole in the tibia and how to correctly perform CPR. The day ended with a discussion about the different courses and pathways offered at ECU. Overall, it was a very enjoyable day and we would definitely recommend doing this again. 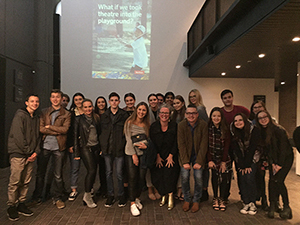 On Tuesday evening 26 June, the Year 11 and 12 Drama students had the pleasure of attending the Black Swan State Theatre Company’s production of The Events in the State Theatre Centre. Starring Catherine McClements, the students were enthralled by this performance as part of an analytical assessment task. They also had the good fortune of meeting Clare Watson who is both the Director of The Events and the Artistic Director of the Black Swan State Theatre Company. Ms Watson was kind enough to conduct an impromptu post-performance Q&A which the students used to gain valuable insight into the production and the artistic process. The Events Synopsis: Claire is a left-wing female Anglican minister who leads a community choir. The Events follows Claire after she has experienced something terrible. She attempts to understand the act that changed her life and the person behind it; a boy she vaguely knew, who turns a gun on those who ‘aren’t from here’, trying to make his mark on society. The Boy is an isolated, troubled young man who throughout the play also becomes every other character that Claire encounters and questions on her quest. The Events is confronting and compelling. Tickets are available until 8 July via https://www.bsstc.com.au/plays/the-events, but please note it’s only suitable for ages 16+. 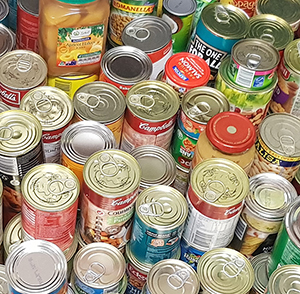 At the start of this term the Year 7s had their first mission project (Give a can, give a damn). We brought in cans to donate to Shopfront during weeks 1-5. Shopfront helps those who are in need and don’t have anywhere to go. People brought in between 1 and 6 cans! These cans were beans, meals in cans, general food etc. If you were generous enough to donate a can you either had to hand it to your homeroom teacher or Mrs Lane. One week during this event, Mr Walsh came into school and spoke to us all about Shopfront and who we are helping. He said that every year we help support over 40,000 people and just by donating cans, we are changing lives one can at a time. I am now happy to announce that we collected over 250 cans for Shopfront!!! Performed along with the Year 9 Dance Class, at Achper Dance Festival on Wednesday night. The girls were a stand out performance and we should be very proud of their efforts. 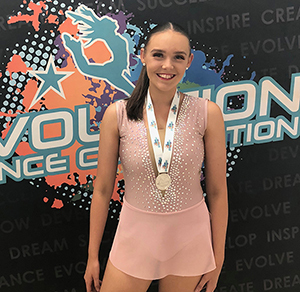 Kiera Andrews (Year 9) competed at Evolution Dance Competition Regional (qualifying for QLD National) making Top 4 Dancer with her highest scoring open solo. Kiera is currently out with an injury and is hoping to make Nationals in January. 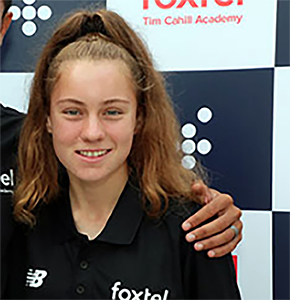 Early next term, Taneesha BAKER (Year 10, Siena E) will fly to Coffs Harbour in NSW to compete in the FFA National Youth Champions as part of the U/15 Girls Soccer Team. This is not the first time she has been a member of the state soccer team in this competition. Taneesha has been named as part of the starting squad, in the position of right-wing and we wish her every success as she represents WA, yet again. 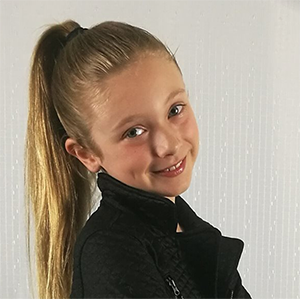 Bailey Perrie (Year 7) has been chosen to sing her original song ‘Step by Step’ at the One Big Voice concert at Perth Arena on 17 August 2018. There will be an audience of over 7000, we wish Bailey every success. Last Thursday, Year 11 student Liam Brnic competed in the state final of the HGT Taste of the Future competition. Eight finalists made it to this stage from schools all over the state. In a ‘Master Chef’ style cook off the competitors were given the core ingredient that must be used. This year’s core ingredient was bronze whaler shark. If the competition was not already hard enough, bronze whaler shark as a curve ball! Liam researched recipes and techniques in the week leading up to the competition and decided on Dukkah Crusted Bronze Whaler Bites served with fresh Asparagus, Dill Aioli and Citrus pearls. Competitors had an hour for food preparation time and 30 minutes to cook and serve their meal to the Judges. This year the Judges were Don Hancey (WA Food Ambassador), Stephen Clarke (Clarke’s of North Beach) and Paul Beard (Perth Arena). Liam did an outstanding job and presented an impressive dish to the Judges. Liam placed 3rd on the day and along with merchandise from the event sponsors, he won $200 cash and Mater Dei College’s Hospitality department won a $500 voucher to Reward Hospitality for hospitality equipment. Liam was the only Year 11 student competing against all Year 12s, and has the opportunity to compete again next year. Congratulations, Liam. Mater Dei College wishes you all the best in your dream of becoming a chef. 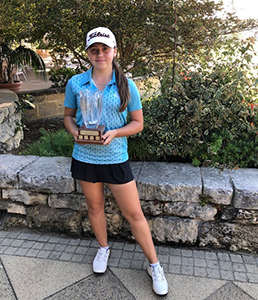 Natalja Brennan (Year 9 MCCB) won the Joondalup Ladies Golf Annual Summer Bowl, coming 1st out of a field of 60 playing over 27 holes with a final score of 58 points. Recently Natalja was part of the U/17 Girls Golf Pennants Team achieving another first. Natalja had her first entrance in early April into the International Girls Amateur competition at Royal Perth Golf Club and has also been selected to be part of the 2018 School Sport WA U17 Girls Golf squad. Natalja has had her handicap down to 4.8 this year, Congratulations Natalja! In the holidays, Caitlin Barnard (Year 10 SIEE) will be traveling to South Africa with the All Australian Schoolgirls Hockey Team, as a goalkeeper. Caitlin will compete against the U/18 South African Schoolgirls Hockey Team in a test match series, which will be held in Cape Town and Durban. All the best, Caitlin! Keeley Grove (Year 10 Salvado House) has been selected in the Calisthenics Association of Western Australia’s (CAWA) State Team, competing in the Australian Calisthenic Federation’s 30th National Championships being held at the Canberra Theatre in July 2018. This is a wonderful achievement as being a State Team representative is something many strive for but only a few are chosen. The Year 7 Girls participated in an AFL carnival on Tuesday 12, June at Inglewood oval. The girls were very enthusiastic throughout the day despite the heavy rain and subsequent losers. Well done to all involved. Thanks to Mrs Martin and Miss Wheeler on the day. On Thursday 7, June, two junior team’s travelled down to George Burnett Park, Karawara, and represented the College with distinction in the annual Champion Schools Touch Rugby (Lower Division) one-day tournament. Our junior female team played five ‘pool’ games against a number of schools during the day winning two matches, drawing one and narrowly losing the other two. As a result, they did not qualify for the finals. Stand out performers from this team included Kiara Bingham, Andrea Moyo, Tahlia Chomiak and Elecia Shaw. Our junior male team won just one of their five ‘pool’ games but two of their losses were by very narrow margins. They also did not qualify for the finals. They can count themselves unlucky though some exceptionally talented teams from Thornlie and Aranmore were included in their ‘pool’. Stand out performers included Josh Bedford, Will Dobson, Sam Ferguson and Fred Walker. A big thank you must go out to Mr Gray and to the two senior student assistants for their coaching and support leading up to the tournament and on the day itself. A hearty congratulations to all who participated. The next opportunity for these young students to display their talent and skill against high quality opposition will be at the 2019 Champion Schools Touch Rugby Tournament at the same venue. Mater Dei def Wanneroo 12-0. The score tells the story unfortunately, Mater Dei were overwhelming too strong for the young, inexperienced Wanneroo team. Goals: Andrea Moyo 5, Dior Mackin 3, Faye Doherty, Destiny Cooke, Katelyn Pyke, & Sara Combes 1 apiece. We set off to Woodvale with only 10 players, feeling a bit nervous as Woodvale are always a slick team. The play was very even until Andrea Moyo scored our first goal off a great pass from Faye Doherty, taking us into half-time 1 up. The play continued to be a hard fought battle into the second term until Woodvale finally equalised bringing the score level. Both teams had many scoring opportunities but the score remained level right up to the last minute when Katelyn Pyke finally put one away to secure our win. We welcomed back from injury Caitlin Maloney, who did a great job as keeper in the first half and were lucky to have Maggie Beckwith filling in for us as she did a sterling job in defence. Congratulations to Emily Bicknell who took on the role of keeper in the second half and showcased her AFL marking and kicking skills! Thank you to the parents who braved the chilly weather to support us. Current Year 12 students who have demonstrated academic excellence and/or are making a significant contribution to their school or community may want to consider an early offer application to Notre Dame University. Such an offer would mean that they can sit their Year 12 exams with added confidence and reduced stress. Early Offer applications for Semester 1 2019 are due 31 July 2018. 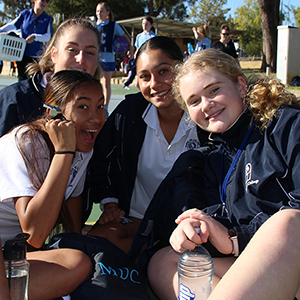 Year 10, 11 and 12 students are invited to Notre Dame’s Fremantle Campus for A Day in the Life of a University Student to experience what student life at Notre Dame is really like! Visit our campus, take part in lectures and activities, enjoy a tour of our town university, and meet current students and academics. Considering your University options, but unsure of the right degree for you? Book in for a 1-on-1 advice session at the Fremantle Campus during the July school holidays. Speak with our advisors about degrees that align with your strengths and interests, and learn how to apply. Kick-start your study journey at the Notre Dame Open Day. Enjoy the atmospheric Fremantle campus, check out the facilities, enjoy music, food, games and get involved in the festivities. Daniella Dickinson (Yr 8) has been awarded her Bronze level card. The Year 7, 2020 enrolment process is now complete. We encourage all siblings to have an application lodged for enrolment to be completed to ensure a future place at the College. A special invitation has been offered to students and their families of Mater Dei College, please see below for details. UWA is offering a ‘Plant the Seed of Knowledge tour on 12 July 2018.